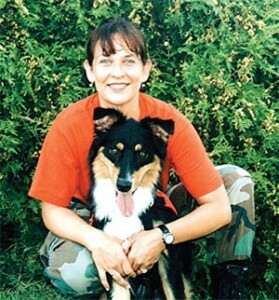 Kelly with her search dog, Luke. If you need to understand the issue of wandering Alzheimer’s patients and the ongoing effort to find them, Kimberly R. Kelly is the person to talk to. Kimberly is founder and director of Project Far From Home, an educational program designed to teach law enforcement, fire, EMS, and search and rescue (SAR) teams about missing and at-risk Alzheimer’s subjects. She is also the Commander of 1SRG, 1ST Special Response Group, an international, non-profit, non-governmental organization that specializes in rescuing or recovering missing persons in extreme situations or climates. Kimberly is the author of Project Far From Home: Understanding the Missing at Risk, Wandering Alzheimer’s Subject, and contributor to In Search of the Alzheimer’s Wanderer: A Workbook to Protect Your Loved One and Urban Search: Managing Missing Person Searches in the Urban Environment. Kimberly is a retired law enforcement reserve lieutenant, specializing in search and rescue and underwater search and recovery. 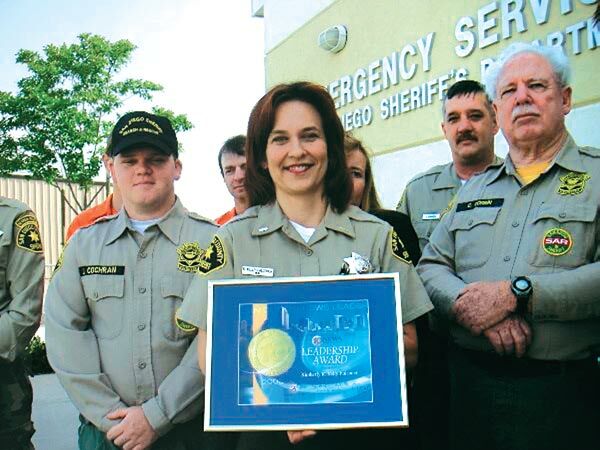 She was awarded the San Diego County Sheriff’s Department Distinguished Service Medal, and was recognized with the President’s Volunteer Service Award by President George W. Bush for her efforts in search and rescue. Preserving Your Memory: Wandering is a nationwide problem for Alzheimer’s patients. How widespread a problem is it? Kimberly Kelly: Currently, in the United States, there are an estimated 5.5 million persons with Alzheimer’s disease. Research shows that 60 percent, or three in five persons with Alzheimer’ disease, will wander away at least once during the course of their disease. Some experts put that percentage as high as 70 percent. Most individuals with Alzheimer’s disease wander away multiple times, with anecdotal evidence suggesting an average of 6 to 8 times before family or caregivers recognize wandering behavior or its dangers. A review of law enforcement and search and rescue records indicate an average of 125,000 search and rescue (SAR) operations each year for missing Alzheimer’s subjects. In most categories, SAR missions are going down, or declining, for a variety of reasons. However, SAR missions for the missing at risk, wandering Alzheimer’s patient are increasing dramatically, and that is expected to continue to increase exponentially over the coming years. PYM: From your experience and research, what programs or initiatives, if any, are most helpful in locating and returning wandering AD patients? 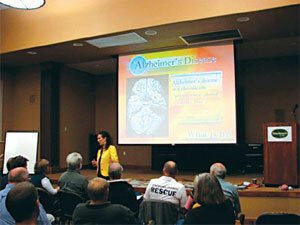 KK: I highly recommend the Alzheimer’s Association’s Safe Return program. It was been an invaluable resource to me, in the field, during a mission, when I was working as a law enforcement reserve in search and rescue. I simply called them, notified them of our case, and provided the required information. If the subject was enrolled, Safe Return was often able to provide us with information that had not been discovered during our witness interview. However, if the subject was not enrolled, Safe Return still assisted by entering the information into their system, and coordinating with their own resources. I also am strongly encouraged by the number of states that have enacted Silver Alerts, or communities that utilize a community notification system, such as UCAN or a Reverse-911, to alert the public when an Alzheimer’s subject goes missing. In both the Safe Return and Silver Alert systems, we are able to incorporate the public into our search, which increases the probability of early discovery, and thus, reducing mortality rates associated with long elopements. PYM: According to your numbers, 46 percent of wandering cases end in fatality. In your view, why is this number so high, and what can be done to improve efforts at locating wanderers? Kelly and her team have won numerous awards for their search-and-rescue efforts on behalf of Alzheimer's patients. KK: Actually, the 46 percent mortality rates comes from the 1995 study by Robert Koester and David Stooksbury, in which they analyzed SAR missions in Virginia for missing or wandering subjects with dementia of the Alzheimer’s type. They found that Alzheimer’s subjects not found within 24 hours, if found at all, had a 46 percent mortality rate. However, in factoring mortality rates, it is also important to consider weather, terrain, environmental issues, the individual’s ability to survive, the community’s response to a missing person, and more. In Nova Scotia, for example, a place with more extreme weather conditions, an Alzheimer’s subject not found within 24 hours faces a 70 percent mortality rate. A 1994 compilation of search records for Rim of the World Search and Rescue team consisted of mission records from 1968 through 1994. In reviewing those missions, it was discovered that no person aged 60 or over, with Alzheimer’s or not, survived beyond 24 hours, if not rescued during that critical window [100 percent mortality rate after 24 hours, aged 60 or over]. Again, weather and extreme terrain appears to play the biggest factor in this geographic region. However, mortality rates remain high in urban areas, as well. Contributing factors include wandering subjects not being recognized as in distress by the community, subjects walking into traffic and being struck by vehicles, or other community-based hazards. The single biggest factor, in my personal and professional opinion, in rescuing (versus recovering) the wandering Alzheimer’s subject is early notification and mobilization of law enforcement (LE) and SAR teams who have training and an understanding of Alzheimer’s disease, and its related behaviors, particularly in a field setting. However, because LE often has other conflicting demands, and searchers are few in numbers, it is absolutely critical to notify the public. Personal experience has shown that oftentimes, my subject was “found”, or encountered, by multiple members of the community who, unaware that they were speaking with, or assisting, an endangered missing person, long before they were ever found by LE or SAR. PYM: In your view, what can we do as a society to reduce wandering and improve the survival rate for those who do wander? KK: I think it’s important to understand that not all wandering is harmful. In fact, it can be quite therapeutic, allowing for exercise, enjoyment of nature, and meaningful exposure to the world and other persons, which in itself may be helpful in reducing the depression commonly associated with Alzheimer’s. Kelly teaches law enforcement and emergency service personnel nationwide. Healing gardens, walking paths, nature centers, and such can all provide those explorations in the world, and, under the right conditions, allow for the individual to maintain some independence and autonomy, and still interact with others. Many care facilities and centers are designing such facilities, so they can turn harmful wandering and pacing into a secure, safe, enjoyable place to explore. However, it is difficult for the average homeowner or caregiver to provide that type of escape while maintaining such vigilant security. Many caregivers also have their own health issues, which limit their abilities. “I’m 67 with a heart condition; I can’t just go chasing him down if he wants to go for a walk!” Many have said that it takes a village to raise a child. I believe that as a village, we must also support, and many times, save our at-risk elders. When the missing at-risk person with Alzheimer’s has already wandered, time is of the essence. The community must respond, just as it would for a missing child, because the risk of harm or death is simply too great to ignore. For the community to respond, they must know, and this is why I support programs such as Silver Alert. And for community to care, they must understand. Educating the caregiver, the public, and law enforcement about at-risk wandering is absolutely critical. By proactive, preventative education, we may be able to reduce many of the factors that lead to wandering in the first place. Wandering is predictable—60 percent to 70 percent will wander at least once. Many wander away multiple times. Unfortunately, the potential for serious harm, even death, is a very real risk for a wandering Alzheimer’s subject. It’s not enough to say, “Well, maybe it MIGHT happen someday.” We must prepare as if it WILL happen. Predictable means preventable, and just by taking a few steps today, to understand and prepare, we will be able to save the lives of untold at-risk Alzheimer’s wanderers. PYM: Won’t this problem only get bigger as the elderly population grows? KK: Absolutely. There are about 5.5 million with Alzheimer’s in the U.S. right now. It’s estimated that by 2050, there will be more than 16 million Americans with Alzheimer’s. Researchers estimate that 60 percent will wander, but the real figure is probably closer to 70 percent. You can learn more from Kimberly about Alzheimer’s, dementia and wandering in the DVD Plain Talk About Alzheimer’s Disease, available from Vision Video, PO Box 540, Worcester, PA 19490. You can order by phone at (800) 523-0226, or order online at Vision Video. Source: www.ALZinfo.org. 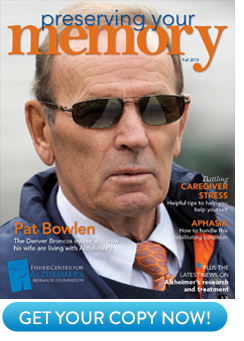 Author: Sam Gaines, Preserving Your Memory: The Magazine of Health and Hope; Spring 2009.